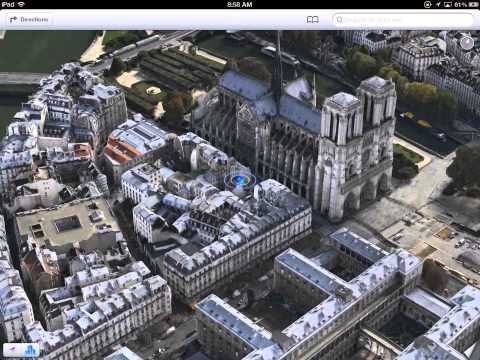 Apple continues to gradually expand the number of cities that support its 3D Flyover feature in iOS Maps, with Paris being the latest addition. The update to Flyover in Apple's proprietary Maps application, which was first noticed by iGeneration, also extends beyond Paris to surrounding areas, including Versailles, Aulnay-sous-Bois, L'Hay-les-Roses, and even Disneyland. It's unknown whether any other cities were updated alongside Paris. The new 3D mapping option in Paris comes about two months after Flyover rolled out to 15 new ctiies around the world. Flyover was introduced in 2012, when Apple replaced Google Maps with its own in-house solution. Flyover allows users to view cities and buildings rendered in 3D. The interactive maps combine overhead images with three-dimensional geometry, allowing users to view major cities in new and unique ways. Apple has also been continually hiring new personnel in an effort to improve Flyover and its iOS Maps application overall. With the launch of Apple Maps last year, Flyover in particular was plagued with distorted imagery that gave inaccurate renderings of landmarks such as the Hoover Dam and Brooklyn Bridge. Updates to Maps Flyover data has been gradual but slow since iOS Maps debuted last September, as evidenced by the fact that it took more than seven months for Flyover support to come to Paris ? one of the most famous and most visited cities in the world. The first city I went to test Flyover with. Oh, well.. Better late than never. Wow. I just checked it. Its awesome. Silently they are working on Maps, it seems. My own town is included with my home, it very nice!! Compared to how poorly the algorithms seem to handle trees, I'm sure they must have touched up the Eiffel Tower and the Arc de Triomphe manually. This makes no sense. Why is Apple wasting resources on flyovers? Nobody -- and I mean nobody -- uses this feature of Maps. I don't think anybody even knows how to get into this feature of the Maps app, let alone using it once they're there. Apple should be focusing on fixing all their broken & terrible directions, instead of something superfluous like flyovers. Seriously, Apple, get your act together. you are so right. not a single person in the entire world, apple employees included, have ever used or will ever use the flyover feature of maps. and the only thing that all 80,000+ employees of apple are doing is working on flyover. hell, if you call the apple support line you right now you'll hear a silly recording that says "we can't come to the phone right now because we're busy working on apple maps flyover just to piss off scotty321"
Its not bad algorithm. There are millions of trees to touch. And there is only one Arch de Triomphe and only one Eiffel Tower. Do you want Apple to touch all the Trees that are not significant on maps? Remarkably telling that such a city wasn't covered previously. Heck it's probably one of US citizen's holiday destinations so it's not even necessary solely a benefit for Europeans..
Ive ditched Apple Maps. So so much happier with Google Maps. It actually knows how to look up things near where I live, and flyovers is only really useful for tourists. Arc de Triomphe without a single car? Looks weird. Finally! It's over a huge part of the suburbs too and with great quality! I hope they make lots of ads about this in France, it's a detail but an important one! Couldn't agree more. That said, I am sure (I hope) they are. So far, at least for me (and given where Iive), Apple Maps directions are truly second-rate -- on more than one occasion, it has either failed to find some obvious addresses, or it has given me directions that are circuitous and non-obvious (upon subsequent checking with Google Maps and MapQuest). I don't use it any more because I don't trust it. Google Maps is so much better currently. I'll check back in a couple of years. I am uploading to Vimeo & will repost! At this rate, they will add average-sized midwest cities by 2023. Ive was never on that team; he is the head of industrial design. Directions and search are too separate things altogether. Directions work fine. Search is a disaster. I search for Starbucks while looking at Paris and it shows me a random Starbucks in Texas (just a random example). Just try searching for Googleplex.